CAPA College Results 2018 – CAPA College (Creative and Performing Arts College)…excellence in Arts training & education. Congratulations to the CAPA College Class of 2018 who have achieved phenomenal results this year; the college’s best yet. CAPA College (Creative and Performing Arts College) is a specialist Arts college based in the heart of Wakefield. It offers full-time Arts training and education for students aged 16-19. An exciting alternative to traditional sixth form education, CAPA College equip students with the knowledge, experience and enthusiasm to pursue careers in the professional Arts sector: both on stage and backstage. CAPA College are proud that since their inception in 2006, all of their students have graduated with 100% pass rate and 100% acceptance at first choice higher education establishments and this year is no exception. 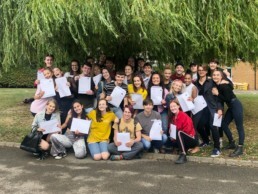 This summer the 50 plus students who made up CAPA College’s Class of 2018 nervously collected their A level and BTEC results from CAPA College’s temporary home on Thornes Road, Wakefield. They needn’t have worried: the hard work and perseverance of these talented students paid off. All of the students, who were enrolled on either the Performing Arts: Musical Theatre or Production Arts: Theatre, Film and Media pathway, achieved or surpassed their predicted grades with 100% pass rate and 85% A*-B. These were well-deserved results for a cohort of wonderful students. In addition to these amazing results, this was also an incredible year for student destinations. Students this year have progressed straight into the Arts industry and gained places at leading conservatoires in the UK and abroad, including Urdang Academy, Trinity Laban, Guildhall School of Music and Drama, Performers College, Northern School of Contemporary Dance, ArtsEd, Laine Theatre Arts and Koninklijk Conservatorium. Well done CAPA College Class of 2018 – best wishes for an amazing future and keep in touch!